I was born in Bakersfield, California, Kern County. I remember tumbleweeds and oil wells! My daddy was the pastor of a small Pentecostal church, so we didn’t have a lot of money. We lived on a dead-end street in a close-knit neighborhood. My older brothers shared a bedroom, as did my little sister and me. And we all shared one bathroom. I remember playing outside until well after dark. We just had the best time — hide-and-seek with flashlights, hopscotch. I loved being able to walk to school, carrying my violin. The violin didn't work out, so I played piano instead. Mom wanted each of us to learn an instrument, and she was huge on music lessons. She loved music. I rode my bike to the library. I had this incredible love of books. When I got my bicycle license and my library card, that was the coolest thing ever! I had arrived! We had lots of pets. My mom was a saint and wanted to do right by us kids. One summer, we had a tortoise, a kingsnake, white mice — to feed the kingsnake — a dachshund named Penny, a rabbit in a hutch out back, and a chameleon. Mom was amazing. I look back now, and I don't know how she did it. She was an active pastor's wife, mother of four very active children, and she struggled with Crohn's disease her whole life. She was very passionate, friendly, and loved people. My mom was a little bit of a rebel, actually. The Pentecostals were very strict, but Mom didn't listen to a lot of it. She did what she thought was best — and what she wanted for her kids — as long as she had prayed about it. She and Dad were very solid in their faith. Not a hiccup. What they preached in the pulpit, they lived at home. We were at church three or four times a week — and on a revival, we were there every single day! So growing up, I was surrounded by an extended family of the church, which was very, very close and supportive back then. My father lived 17 years longer than my mother. I just lost him three years ago, and it was devastating to me. He and I were very, very close. He was extremely busy throughout my childhood. He was so dedicated to the ministry, and he felt that was his calling — and he wasn't going to do anything halfway. He constantly wanted to do the right thing. I can remember the security I felt as a child when I'd hear my dad praying in the night. It was so comforting to me that he had a source — that he didn't have to figure things out on his own. Dad developed an extensive program centered on mission work, but the Pentecostal denomination didn't want to support programs like that at the time. So he transferred to the Assemblies of God, and that's why we moved to Southern California when I was 11. Shortly thereafter, he was called to Memphis, where I went to junior high and high school. Germantown, back then, was a beautiful country environment with a small school. We ended up living there because it had very affordable homes at that time. Coming to Memphis was a huge culture shock for me. In California, I was an outdoor, no-makeup, sundress-and-flip-flops girl. Here, there was a Southern code of dress — everyone wore name-brands and extensive makeup and joined sororities. My parents couldn’t afford all of that, so I wasn’t part of the “in" crowd. I was traumatized for a few years! So I retreated to my large, endearing church family. And it was so hot and humid here! Eventually, I found my place at school. Right after high school, my dad was called to St. Louis, where I went to Junior College. He was then asked to go to the Assemblies of God headquarters in Springfield, Missouri. There, I worked full time with my dad in a gospel publishing house, where I met a couple who had a son who was extremely handsome! They were planning a mission trip to Kenya, and I wish it had been a noble reason that I signed up to join them, but it wasn't. I signed up because the son was going — and then he ended up not going, and there I was, on my way to Kenya! The wife and one of the chaperones were nurses. Over a six-week period, I kept asking them about nursing. I was just mesmerized by what they told me. They took me to the Nairobi hospital to see a surgery. The operating room there was called a theater, and observers could go and look down at the surgery. I watched a lumbar laminectomy. And that was it! I knew then what I wanted to do with my life: be a nurse. I returned home to Springfield and entered nursing school in 1975. About that time, my brother — who was a dentist in Memphis — said he wanted the family to come down and meet his new wife and her family. Turns out, they had set me up! It just so happened that there “wasn't room” at the dining room table for me or Randy, the new wife's brother, so we sat together in the living room with TV trays. We talked about our love for the Allman Brothers and Harley-Davidson motorcycles. He said he had a Harley, and we both drove VWs. And that's how I met my husband. I was a surgery and ICU nurse during my early career. Throughout my years of nursing, I heard about "visiting nurses” — ones that went out to the home, but also helped out in hospital settings here and there. But I didn't hear a lot about agencies or temporary nurse staffing companies until I came to Memphis. It was a new concept for me. My husband's job brought us to Memphis in 1982, where I worked in nursing until an opportunity came up in 1983 for me to teach at Baptist Memorial Hospital School of Nursing. When my seniors graduated in '88, I decided I wanted to spend more time with my two young sons, so I took a part-time position at Methodist North Hospital — until a huge budget cut necessitated laying off 10 people! I had never been laid off before, and I actually found it kind of liberating! I signed up with Kimberly Nurses — sort of a temp agency for nurses — to pick up a little extra money while I decided what I was going to do. One of my jobs took me to St. Francis Hospital. One day, I heard some loud talking and laughter in the hall. It turned out to be another O.R. 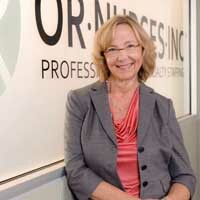 nurse, Carol Paterson. We immediately clicked, and she said, "I've got an idea." So despite not knowing her prior to that little pocket of time, we started O.R. Nurses Inc. in 1988. We required our nurses to have five years' experience, and we had cream-of-the-crop professionals. We started contracting with local hospitals, including Le Bonheur and The Med. We filled in for nurses on vacation, maternity leave, sick leave, etc. Carol was incredible. The only thing we really differed on was that she wanted to handwrite all the checks and invoices because it was more personal. I kept telling her, "Stop it! Give those to me; I'm going to type them!" She was an absolute hoot! Before our company's first anniversary, Carol told me she had ovarian cancer. She just said she had it, she was having surgery, and once she recovered, she'd be right back on track. She said it was just a blip in the road. In April 1990, she called me from the hospital with her attorney. She wanted to put everything in order to ensure there was a seamless transfer if something happened to her. She was adamant that absolutely nothing would hinder the company or the nurses if the worst happened. I thought it was just a formality on her part. We didn't know she had stage four cancer. Tragically, we lost her that August. At my kitchen table, I set up staffing, scheduling, payroll, billing — entering everything so we could transition from paper to computer. I knew that once we got through that, everything would be manageable. It was a really difficult and sad time for all of us. But I never doubted that we would make it — I just didn't. I had a lot of confidence in what we had already set up — we hadn't cut corners or done anything halfway. I knew Carol loved the company as much as I did, and she had a huge sense of pride in the excellence we provided. I didn't want to let her or her family down. The company moved from my son's bedroom to a small office in a private home in 1992 when I hired my first employee. We didn't get our first "real" office until 1998. Since then, we’ve just grown each year, and we're honored to be consistently ranked as the largest women-owned business in Shelby County. We were first runner-up for "Best Places to Work in Memphis – Large Company," and I was recently inducted into The Society of Entrepreneurs — an incredible honor. But if any of us think that we've made our achievements on our own, we're mistaken. There is no way I could have done what we did — or do now — without my team here, nor without the help of so many people throughout the years. Certainly, it would not have happened without Carol. The part of nursing I miss most … working hands-on in surgery. The battle I get most tired of fighting … is the misperception that temporary medical staffing is not a smart business alternative. Fortunately, the new school of thinking sees it completely differently. They see agencies as a cost-effective partner. My favorite medical sitcom … I love House M.D. Is it realistic? No, it's extreme! But that's what's interesting. I like it because it sticks more to medical rather than just drama. I can't watch E.R. because it's too much like a soap opera. The part of this job that requires the most stamina … is managing people and the different dynamics of people's lives. Life happens to all of us, however, so managing those incidents is sometimes challenging. If I could do one thing over … I look at life this way: When you ask God to guide your life, you don't go back and question why you were sent down certain paths. Even when the bad things happen, you'll see good come out of it. My mother's Crohn's disease … was devastating to her at times. It kept her from doing some things that she would have loved to do. She was a very strong, independent woman. The disease also made me a very strong, independent woman. As a child, I didn't want Mom to worry about me when she had so much else to worry about. I realized there wasn't a Santa when … one Christmas when I was 7 or 8, I asked Santa for a bicycle. But I could hear my parents in the living room building it! Mom and Dad couldn't afford much, so they had gotten a used bike, and my brothers helped repair everything and glitz it up a bit. But I knew it wasn't brand-new. I thought, "Wait a minute! Santa is not going to give me a used bike!" But I adored that bike! A big turning point for me … came when I got laid off at Methodist. And it turned out to be such a blessing in disguise. It led me here! I pay a personal price when I … work too much. It's very hard for me not to do that because I feel passionate about my profession and, therefore, my work. Doing five triathlons … is enough! Five years ago, I thought I had something to prove. My husband is big into triathlons, and he taught me how to swim laps. He got me a fancy racing bike. Running is not anything I've ever enjoyed, but I did it. I even got some awards, which totally surprised me! But now I just want to walk, swim, and bike with friends for fun. One question I would like to ask God … Why is there so much confusion over a few mentions of homosexuality in the Bible? I believe that God makes each of us, and it breaks my heart when i see such confusion, misunderstanding, and unnecessary hurt that so many individuals endure. My greatest extravagance is … gosh, now that I think about it, I guess I'm not very extravagant! But what I would like to splurge on is an original piece of art. The closest I've come is a framed piece of art in my office — which is actually a page from National Geographic! I'm not very good at … athletic events — past triathlons notwithstanding. That's just not my nature. I'd rather have a good time in activities and enjoy the fellowship. I guess if I were a serious athlete, I could work out and enjoy it, too! From my mother, I got … my love of learning. We didn't watch a lot of TV — if ever. Mom made her own flash cards for multiplication tables, and I remember her sitting there making sure we learned them. Anything we had to learn in school, she was right there, very involved. As a child, I thought I would be … a journalist. I loved books and English, and my dad told me I was a great writer. Prior to the Kenya trip, there was nothing in my childhood that even remotely hinted that I would become a nurse! When I'm not running my business, I like to … spend time with my family. My son Bryan and daughter-in-law Casey, my new granddaughter Larkin, and my son Jerrod are amazing blessings in my life. Family time is usually having everyone to the house for dinner. With my friends, we do anything art-related. We love to trek Downtown, go to the farmers market or eat at a restaurant there. And we don't miss a festival! Also, kayak trips. I enjoy anything outdoors. The most valuable lesson I was taught was … to love. My parents, no matter what, always showed love. And that's really all we're called to do. Truly. My husband came to work for the company full time … in 2005. In 1995, we made the decision that he would give up his demanding career and focus on our sons while being a resource for this business. He handled legal, insurance, accounting — all those pieces that I don't like! When I got into trouble as a child … my father was so kind. He never had a cross word with me. Ever. And it wasn't because I didn't deserve it! He was always compassionate and very wise. He was firm, we'd discuss it, and then we had to pray! One thing I'd like to do before I die … go to Italy! Of all the awards and honors I've received, one that meant a great deal to me personally … was being inducted into The Society of Entrepreneurs. For them to think I belong in the same category as the caliber of people in that group was absolutely humbling. I couldn't believe it. And when I met the other members, they are some of the nicest businessmen and businesswomen I've met. Down-to-earth people who just happen to enjoy and love what they do, and have been very good at it. When I retire from the business … I'd like to do something related to nursing. I want to give back. My final 2 cents … One of my favorite people was Mother Teresa, mainly because of the depth of commitment she had and the depth of sacrifice she made. I know I could never do what she did, and it amazes me that she could do what she did. She once made a statement: "We can do no great things, only small things with great love." That's how life should be.